There are 22 reader responses to "Reader question: Does repaying a loan hurt your credit score?". Closed accounts still factor into your average credit age. It’s only when a closed account ages off past 10 years that it impacts your average age (and might impact your credit score). Since Luke is only 27, I doubt any of his closed accounts have aged off his credit report yet. In my experience, credit age is a very SMALL percentage of your overall credit score. According to CreditKarma/FreeCreditScore/Citi/Chase/etc sites, I have an average credit age of about 3.5 years because I churn CC offers (usually 4-6 a year for their bonuses). I have over 8 inquiries on each of my 3 major credit reports in the last 2 years. I currently have 8 open CC accounts and over 20 closed accounts. Most closed accounts are less then 5 years ago (on average I keep a CC open 1-2 years). Yet every FAKO scores I get free from credit reporting sites, my banks, CC companies, etc, etc are 825+. Why? Because my utilization on my available credit cards in below 10%, usually less then 5%. The best thing Luke could do, at least 4-5 months before he gets his mortgage, open 4-5 credit cards (ones with good bonus offers, at least $100 per card) and maybe a Personal Line of Credit with his primary bank. Spend as much as is needed to get the bonuses on the CC’s, pay their balance in full and then sock drawer the cards. By the time it comes to apply for his mortgage the cards will have seasoned on his credit report a little and his credit utilization will be better, which will raise his overall score a LOT more then what his average account age is. It’s really hard to know if what Luke is doing is good or not for his credit if he doesn’t tell us what his credit score was before and after the events. There is a BIG difference between my score was 780 and it dropped to 770 vs it was 660 and it dropped to 620. I’ve never had a score above 800, and usually the only negative mark against me is the age of my credit. I’ve been sitting at about 3 years with all other stats being perfect (don’t have any debt except credit cards I pay off every month), but it feels like the only way to get my score any higher is to just sit on my credit cards for years without applying for anything new. I’ll apply for another from time to time due to finding something with a better bonus, and I’ve got several sitting around with nothing on them just to improve my utilization and age. Seems like credit age takes forever to have an effect, like it’s expecting a number in decades rather than years. Maybe when I’m 40 I’ll finally hit that 800+ mark. There’s not a lot of difference between 750 and 800 — I wouldn’t sweat it too much. It’s hard to say what I’d do without knowing Luke’s interest rates on the debt. If they are high (>6%) I’d pay them right away even if it delayed purchasing a home for a few months. If they are low (<4%) I'd pay them slowly and invest the difference into a down payment fund, emergency fund or retirement savings. In the middle is a bit of a grey area depending on personal preference. One thing is for sure. I would NOT worry about paying off the debt hurting my credit score. If the credit score is not in the excellent range, I'd probably focus on getting it up before applying for a mortgage. I was in this position a few years ago, and paying off my loan definitely lowered my credit score (at least according to one of the free pseudo-score sites). Because of how old it was and some more recent credit cards being opened, it shifted my average age of credit quite significantly. I don’t remember the exact point change, but it changed from “low excellent” to “high good” or thereabouts. I wasn’t about to buy a home or any other event where my credit would particularly matter, so I was happy to have the debt gone (and over time the average age has crept back up, of course). A mortgage broker can provide a better recommendation based on the type of loan Luke wants for his purchase. Talk to multiple brokers and loan officers to determine a good fit. This is just as important as having a good real estate agent. Underwriting requirements have gotten crazy, and depending on Luke’s debt ratios, he may need to pay off the loans before closing, plus have documentation from the lender confirming the payoffs. A good broker loves prepared buyers and will be happy to talk to Luke months before he’s ready to apply for a loan. He/she will provide guidance about what Luke needs to do with his current debt accounts and what documentation he’ll need for the loan. All buyers should get pre-approved (not just pre-qualified) for a mortgage before they start their house hunt. This will give them a better idea of how much money they’ll need to bring to closing and confirm their price range. Having financial paperwork in order will make the process less painful. That’s a complicated equation. If it was me, I’d pay off the student loan first. It’s easier to deal with one thing at a time. I think it’s not that difficult to get a mortgage these days. That’s just me, though. Good luck! JD, can you please explain “Honestly, I wish I could take out a mortgage for my house. No joke.” What are the larger goals you might be shooting for (in the previous sentence above) that would be worth the added risk and mental overhead of a mortgage? I’m struggling to understand this trade-off. Hey, Ella — The $450,000+ that is sitting in my house is illiquid. It’s dead. I can’t do anything with that capital. If instead I had been able to take out a mortgage on most (or all) of that at 3.5% or 4.0%, I could have then put that money in the stock market. (Or, more precisely, that money would have never left the stock market.) In the market, it’s subject to drastic ups and downs, it’s true, but I also know that historically stocks have returned close to 10% annually before inflation, etc. I’ve been considering an article on my current financial situation, the things that I’m happy about and the things that I’m not. It’s a strange, strange thing. I have a lot of money, and I know it. But because in the past year I’ve shifted my assets allocation from stocks to other things (this house, start-up businesses), I feel antsy. I would feel much more secure if that money were in the market instead. Like I say, it’s strange, and it’s worth its own article, I think. I go back and forth on this, it seems like, on an almost daily basis. We have 2 paid off properties (previous homes we lived in, paid off, moved and turned into rentals), and then our current home (we have a mortgage at 3.25%, will eventually turn into a rental). Some days I want to plow all extra money at the current mortgage so it’s gone, and other days, I want to re-fi/cash out the other 2 properties to invest in more. For the moment, I’m just going to sit tight, save the extra money for down payment on house #4 (assuming interest rates will go up when it comes time to purchase) and hope the housing market crashes so we can actually afford house #4. JD, you are talking about leverage. You’d have a better ROE if you had the mortgage. Tax benefits too. However, I like the idea of not having a mortgage though. You’re a free man because of it (h/t to Harry Browne). Otherwise, I think the folks that worry about credit scores here generally shouldn’t. The difference in their scores is not going to make a difference in qualifying for a mortgage or result in a different interest rate. I’ve had a roughly 800 score for most of my adult life. While I’ve qualified for some favorable rates – I think they were really any better than a 740 or so. Why fret over a few points? Pay your bills on time, use credit responsibly and it all falls into place. Not a comment on this article directly – just a request. Now that we can no longer get notifications by email when each article is posted, can you please include links to all of the week’s articles in your Friday newsletter instead of just a selection? Hm. JoDi, I might have to set up a separate feed for folks who want to subscribe to ALL articles. I’m getting other people complaining about there being too many links in the Friday emails. They’re not bothered by the length of the commentary (which I would have guessed would be the hold up) but by there being too many links to sift through. Go figure! Maybe I need to offer a “high content” subscription and a “low content” subscription. The low content subscription would include just one link from me, one link to another money site, and one link to something non-financial. The high content subscription would include ALL GRS links from the week, plus the current three links to other money articles. All of this may solve itself, however, in the near future. I suspect that I’m going to return to a lower publishing frequency within the next month. Not positive, but it seems likely. What would I do? Pay off the student loans before thinking about a house purchase. Not only would I not want two large debt payments to worry about, but as we all know, houses are expensive to maintain – much more than you can ever plan for. Luke is only 27. My recommendation to him would be focus on eliminating the student loan debt by age 30 (the earlier the better) and then starting saving like crazy (allocate the money previously used to pay the student loan plus all possible additional funds) for a good down payment on a home. To me, this is a really easy one. You don’t want a mortgage, period. Rent until you can buy a place outright. 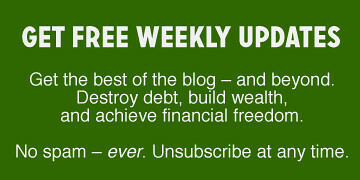 Debt is slavery, and if you live your life debt-free, then a credit score is a non-issue. I’m basically giving the exact advice Dave Ramsey would give, which I think is the right answer. Hmm. I never thought about the fact that when you make your last payment and a debt closes, your score can be affected. I think at this time I’ll pay that on schedule and put my extra payments on my mortgage and LOC where they can do more ‘dama ‘ in becoming debt free. There are too many variables, in both a credit score and a budget to give a straight recommendation. The formula for credit scores is convoluted and proprietary, partially so people can’t game them (though people still try). Paying off a debt for one person is going to have a different effect than fot another. And whether a student loan should be paid off before buying a house also depends on a number of factors: balance, payment, income, house prices in the area, etc. It’s also personal. I didnt pay off my student loan before buying a house. The rate was under 3% and the payment was $68. It was the last debt I paid off (other than my mortgage) and even then it was mostly because i found it annoying. YMMV. Regarding the mortgage question, I consider a paid off house akin to an emergency fund. It is a defensive position not intended to be evaluated in terms of return but in terms of risk. A paid off house requires a relatively much lower cash flow in lean times and provide peace of mind in times of financial turmoil. Plus, as you age, I believe it is also treated differently for means tested services. The amount of feedback here is amazing! Thanks to everyone who weighed-in. It seems there are good arguments for both paying off the debt or maintaining some of it, but it sounds like I should start to think about speaking with a loan officer to understand how my credit simply factors in – since the mortgage loan size and rate is a larger and more complex equation than just the score (of which – I don’t even yet know which one they’ll be looking at). Either way, I feel more confident in handling the situation, whichever way I go with it. I do like the idea of extending my payoff period to free up some capital for other investment opportunities… but at about 4.5% weighted-average int. rate on the outstanding debt, I still need to consider where I might do better than that over 12-16 month pay-off horizon I have left (and I’m not sure I anticipate that’s in the equity market). Also – keen deduction from John on his 4/6 comment – I took a deeper look at the score factors, and utilization did tick up slightly (although not something I expect to sustain over the long-term). It wouldn’t affect average age of credit…not for several years anyhow…and by then your current credit will be aging (provided you don’t add too many new accounts), which might make it a non issue. There are other factors that might have caused the drop. It could be a temporary thing with your other accounts if certain things haven’t been reported or updated yet, or it could be a decrease in account variety, which has a minimal impact on your score. It could also be a reduction in credit availability, causing your utilization to go down. This can be remedied by asking for limit increases in your credit cards (and not spending it). Your DTI ratio will be as important if not more important to lenders, than a drop in credit score, especially if your score is still in a good range, so I would keep focusing on paying off the student loans. Credit utilization to go UP, not down. I never had student loans, but always had good credit, so I’m not sure how much paying off that kind of debt would hurt your chances at a decent home loan. Your debt-to-income ratio and down payment would probably be more important to lenders and home sellers (in a competitive market). I have to object to a few comments about paying off the mortgage. We currently live in the upper flat of our duplex, so after 10 years, we pretty much have someone else paying the mortgage, but there is always upkeep and property taxes, so there’s no “free rent”, even after the mortgage is paid off. Also, the tax benefits for most people of paying mortgage interest is paltry at best. As someone explained it to me a long time ago, what’s the point of paying $10,000 in mortgage interest (if you don’t have to) to save $1000-$2000 in taxes? I’m with the other folks (including JD) to weigh the issue of having a chunk of net worth in an illiquid asset. I like having enough diversity in assets, so that the wild swings of home equity and the stock market don’t cause me too much stress when I look at the estimate of our net worth. Our home equity –about 40% of its purchase price and a bit more with the current online guesstimates — is now about 10% of our net worth (when we sold in California about 15 years ago, it turned out to be about 40%!). I didn’t like being house-rich and cash-poor. Finally, as to the idea that one should never have a mortgage, there are so many variables! Do you ever plan to move (every sale/purchase/move costs $$$)? What would you do with the money if it wasn’t in a house? Why do you want to own a house: control, stability, access to a nicer community, or perceived increasing value/enforced savings?